The history subject collection of the popular Oxford Handbooks series is currently on trial. While most publishers delay the publication of electronic monographs to protect their print market, Oxford University Press committed to a distinct publishing model for the Oxford Handbooks series, which makes the chapters of its handbooks available online prior to the print publication. Take The Oxford Handbook of Modern Russian History, which is not yet available in print, for example: the first chapters were published as part of the 2013 online collection, more chapters became available in 2014, and the remaining content will be published later this year. Oxford University Press plans handbooks on American Indian history, Asian American history, American political history, the history of race, the history of education, the New Deal and World War II for 2015. The 2015 history collection will for the first time include online only articles. While Falvey Library has many of the older Oxford Handbooks in its print collection, it owns only about half of the 2013 and all of the 2014 history handbooks. A complete title list of the Oxford Handbooks history subject collections is available upon request. All articles in the handbook collection are indexed with subject keywords and notes are linked from the text. Articles can be reformatted for printing and/or downloaded as pdf files. Full-text searching is straightforward and the advanced search option offers various useful limits. Each article as well as the various handbooks themselves have assigned DOIs (digital object identifiers), which are preferred over URLs in Chicago-Style notes and bibliographies. Citations for articles are available among others in Chicago Style, but citations can also be exported to RefWords, Zotero and a number of other citation managers. Unfortunately, the search limit for individual handbooks works only for those handbooks which have been completely published. 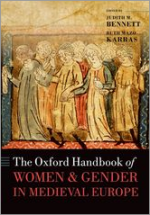 Explore the complete Oxford Handbooks history collection or browse individual titles such as The Oxford Handbook of the History of Nationalism, The Oxford Handbook of Women and Gender in Medieval Europe, or The Oxford Handbook of Environmental History. Trial access to Oxford Handbooks Online will be available until February 11. We are looking forward to your feedback.